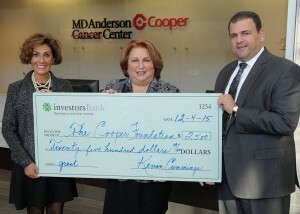 The Jim Fifis Lung Cancer Research Fund at MD Anderson Cancer Center at Cooper recently received a $5,000 grant from the Investors Bank Foundation, in partnership with the Roma Bank Community Foundation. The Cooper Foundation applied for the grant from Investors Foundation and Roma Bank Community Foundation. Roma Bank became part of Investors Bank in early 2014. The foundations support non-profit organizations that enrich diverse communities served by Investors Bank. Since its founding in 2011, the Jim Fifis Lung Cancer Research Fund has raised more than $500,000 for lung cancer programs and research at MD Anderson Cancer Center at Cooper. The fund was created by Nick, John and Chris Fifis to honor their father, Jim Fifis, the late owner of Ponzio’s restaurant in Cherry Hill, who lost his battle with lung cancer in 2007. The fund provides support for clinical research programs, the High Risk Lung Cancer Screening Program, clinical trials, diagnostic tools such as endobronchial ultrasound, and the Patient in Need Fund, which assists lung cancer patients at MD Anderson Cooper with small grants to pay for transportation, prescriptions, utilities and food, when all other sources have been exhausted.